When we landed in New Orleans, we were starving as we hadn’t eaten all day. We wandered around the French Quarter trying to find something open. Most had closed right after lunch and weren’t going to reopen until dinner. Luckily, we stumbled upon the Gumbo Shop which I thought sounded promising. I of course, love gumbo. I like the kind thickened with okra. Roughly there are three types of gumbos; the kind thickened with okra, thickened with file powder or made with roux. File powder is ground sassafras leaves that’s added after the meat/seafood has finished cooking. Roux is flour and fat (generally butter these days but was previously made with lard). The darker the roux, the thinner the gumbo. 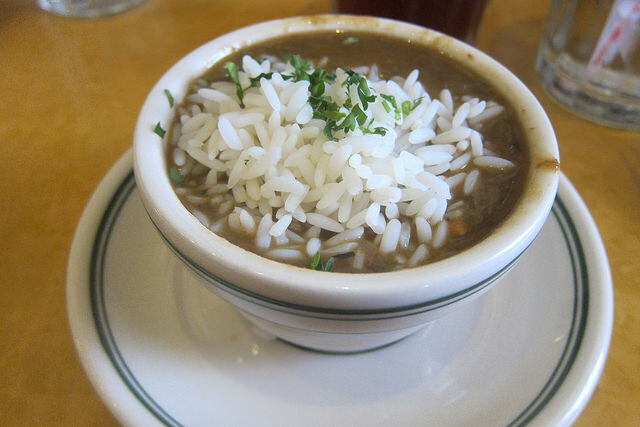 Throughout my previous trip and this one, I ate gumbo every day searching for the best. After a few days, I found myself returning mentally to the chicken and sausage gumbo I had at Gumbo Shop. It was a solid version. I probably could have gotten a bowl of the gumbo and been done with it but I like trying different things hence the Creole combo which came with shrimp creole, jambalaya and red beans and rice. 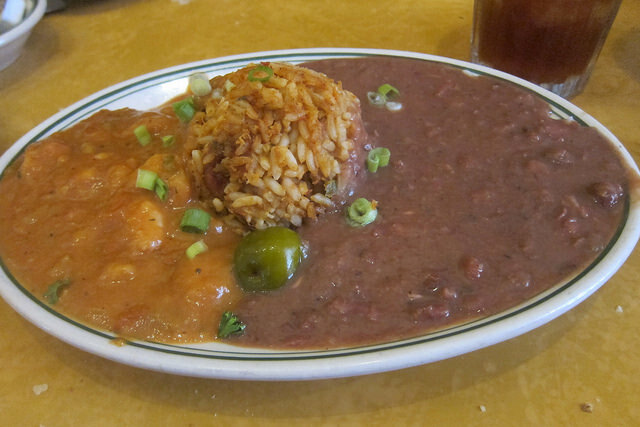 I liked all the flavors but favored the red beans and rice though I like thicker versions generally. After I ate my fill, I started thinking about happy hour… time for a little digestive! I needed it after all those stews and rice.